Game Night: Coup | Warped Factor - Words in the Key of Geek. Gail Williams causes quite a Coup. Who hasn’t wanted to rise up and overthrow the established order? Let’s face it - we all have at some point. Now you can carry the power to overthrow up to three governments in a quarter of an hour with the handbag game of Coup. With a secret deck of two cards, you have to act as if you have the power of those two cards - or any other cards in the pack if that’s your inclination, but if you do lie to your own benefit and some other player calls you on it, then you can lose that card. Of course, if you can prove you’re not lying then the opponent that called you out will lose a card. Lose both cards and you’re out. Keep playing until only one ‘government’ remains. The cards in this game represent a Duke, Captain, Assassin, Contessa and the Ambassador. Each character has a special effect. A duke can take taxes (get three coins) and block foreign aid. An assassin can, well, assassinate - big surprise there right? The Ambassador can change cards with the court deck and block stealing. The Captain can steal two coins off any other player and block stealing from himself. The Contessa however, can block assassination on herself and her partner. There are five of each card which get shuffled and dealt out face down. The two you get make up your government. Each round you can take one action, you can take income (one coin), you can take foreign aid (two coins), you can amass your coins, but if you have ten or more you have to do the last possible action, you can coup. To coup is to pay seven coins to force another player to lose one of their cards, and unlike assassinate - this can’t be blocked. The game is clearly quite easy to play (theoretically anyway), but you can ramp it up. 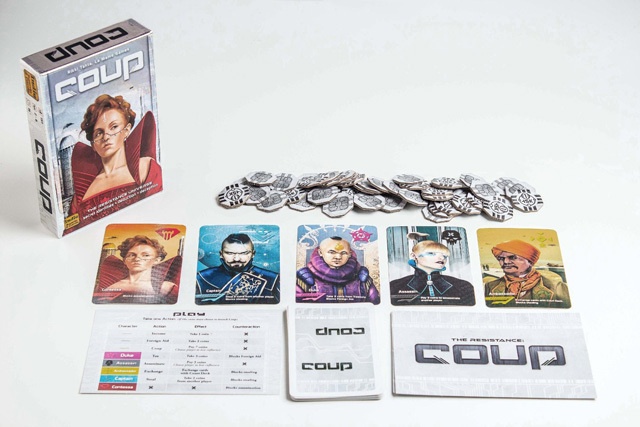 There’s an expansion pack for the first game, Coup Reformation. This allows for another two players (6 in total). Then there’s Coup Rebellion, a fully separate game that takes the same idea and adds of whole new dimension. Instead of five characters you now have 25, that’s a lot of new interactions to think about, and it allows for 3 - 6 players. There is also The Resistance for 5-10 players and One Night Revolution for 3 - 10 players. I have copies of Coup and Coup Rebellion, which incidentally have Coup Reformation in. I have to say that the production values on these are good, they have the look and feel of quality, and good artwork too. So grab the family, get around the table and see who can stage the best coup.